As a sophomore in 2012, Bethlehem boys' volleyball star John Sica excelled in his first season starting for the Eagles. This season, the junior middle blocker solidified himself as the most dominant player in the area. Sica, a first-team Times Union selection in 2012, wrapped up his third season with 198 kills, 34 aces and 95 blocks, and was a major reason for the Eagles capturing their fourth consecutive Section II title. "I'm kind of a team player ... doing whatever needs to be done," said Sica, who averaged 1.34 blocks per game. "I don't care how many kills I get or anything as long as we're winning." Sica, also a standout for the school's boys' basketball team, sported a .540 hitting percentage and averaged 2.7 kills per game. He paid credit to teammate Kevin Mahar, the Eagles' senior setter. "When a setter like Kevin can give you good sets (it makes your job easier)," he said. The Eagles finished the regular season 18-0, including a pair of wins over Division II sectional champ Burnt Hills. Bethlehem swept Shenendehowa in the sectional final and advanced to the state semifinals with regional wins over Oswego and Suffern. "We were just a really close team. We were all friends," Sica said. Sica will return for one final season in 2014 and hopes to end his career with another trip to Glens Falls for states. "We'll have another good team next year, so I think it will definitely be possible," he said. 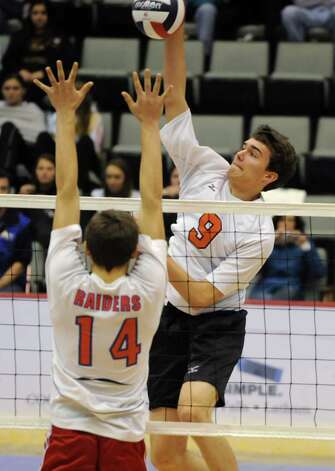 Kevin Mahar, Sr., Bethlehem: Provided a team-best 919 assists to go along with 180 blocks and 57 aces. Austin Nydegger, Sr., Burnt Hills: Earned Division II state all-tournament team accolades in his first year playing volleyball. Sam Pelton, Sr., Burnt Hills: Bounced back from an injury and totaled 21 kills in two regional matches to help the Spartans reach the Division II state semifinals. Scott Grable, Sr., Shenendehowa: The Suburban all-star played a key role in the Plainsmen's 16-6 showing in 2013. Aaron Carrk, So., Bethlehem: Totaled a team-high 276 kills, 99 digs and 48 aces. Drew Haughey, Sr., Burnt Hills: Also a Times Union all-star in 2012, Haughey, a co-captain, made the transition from middle blocker to the back row as the team's libero this season. Setters: Jordan Cotton, Sr., Mohonasen; Colin McLean, So. Shaker. Hitters: Logan Suguitan, Sr., Shenendehowa; JaVar Burch, Sr., Colonie; Josh Miller, Sr., Niskayuna. Libero: Brian Malsan, Jr., Bethlehem. Jason Wood, Bethlehem: The first-year coach guided the Eagles to their fourth consecutive Section II title and a third-place finish in the state tournament.